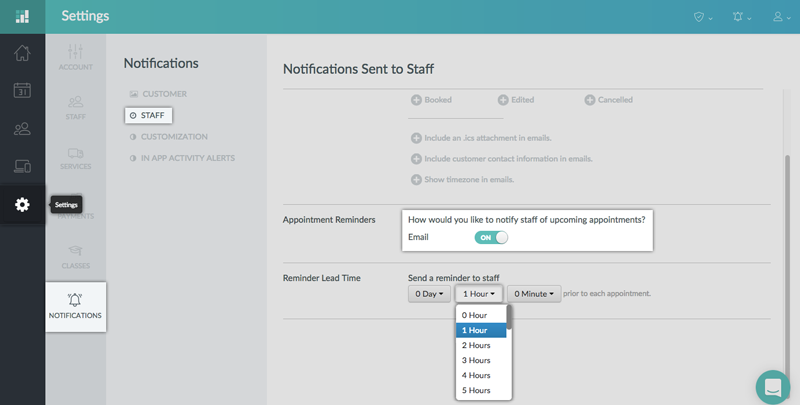 In Setmore you can activate automated email reminders that will go out to staff members at a set time before their appointment is scheduled to take place. This helps keep staff members up to date with impending appointments, and is a free feature included in every basic Setmore account. Navigate to Settings > Notifications > Staff and scroll down to the section titled "Appointment Reminders." Click on the On/Off switch to "On." Staff email reminders are now enabled. Navigate to Settings > Notifications > staff and scroll to the section titled "Reminder Lead Time." Use the dropdown menus to set how soon before an appointment you would like the email reminder to go out. Your settings will save automatically.